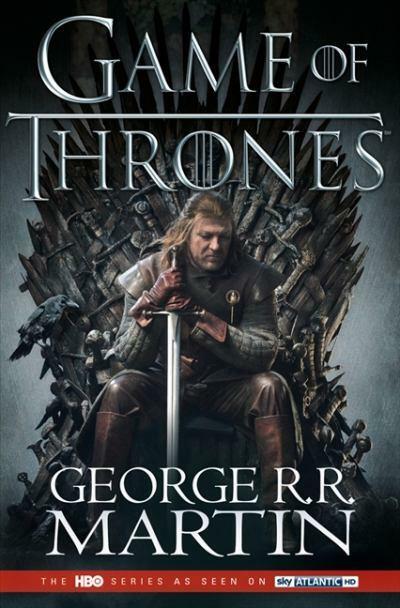 I am currently listening to the audio version of the second book of George R R Martin's A Song of Ice and Fire series, A Clash of Kings. This is the latest in a long line of audiobooks that I have listened to in the last year, some of them more than once. 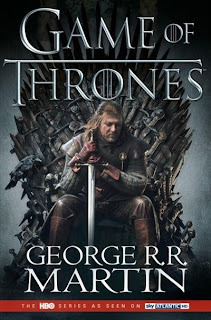 Today, I thought I might muse on a couple of things about listening to audiobooks and then specifically focus on Game of Thrones, with particular emphasis on the adaptation that has taken the world by storm over the last couple of years. At least, that is the plan for this post as I sit down to write it. It could end up taking another direction all together! In some ways I am a bit old fashioned when it comes to how I prefer to listen to audiobooks. I don't tend to download them from places like Audible or even through the library website but rather I like to get the CD and listen to that. There is no real reason for that preference. I don't actually download movies either, but that is possibly a thought for another day and another post. In the case of a big book getting the CDs might mean a huge number of discs that need to be listened to. A Clash of Kings is 30 CDs long, but the next book is bigger again and that is still dwarfed by the audio book of A Breath of Snow and Ashes by Diana Gabaldon that I listened to last year which came in at a whopping 49 CDs long! At the time when I was listening to that book I wasn't driving to work each day so I was only listening for about 15 minutes a day so it literally took me months to get through that audiobook. Sometimes when you borrow from the library you may get the MP3 version which has both advantages and disadvantages. The most obvious advantage for the listener is the much lower number of discs to be managed. Recently I listened to both On the Jellicoe Road and Saving Francesca by Melina Marchetta which were both one MP3 long. Now that I am driving to work most days, I appreciate not having to continually swap discs around while I am driving in order to hear what happens next in the story. I guess I should experiment a little with the whole download thing and see if it works a better in relation to this particular swapping disk aspect. There is definitely at least one disadvantage to MP3 files though. Whereas a track on a CD might be anywhere between 1 and 10 minutes long, the MP3 tends to have much longer tracks, usually matching chapters. This makes it really quite difficult to know go back to a particular spot in the narrative if you want to listen to something again, either because it was a good bit or you got temporarily distracted and need to go back. The fact that there is often only one CD can also make it a bit difficult to determine how far through a book you are as well. Regardless of which format you are listening to, one disadvantage to listening rather than having a book in your hand is that it is difficult to take a sneak peek at the end of the book to see how it ends! I know that some people like to listen to audiobooks to reread books that they have already read but I am tending to use them to get to books that I want to read but I don't have as much time as I would like to actually get to read. For example, I think I know what my next three audiobooks are going to be. They are The Piper's Son by Melina Marchetta (because I have recently become a MM fangirl and now I need to read everything I can by her! ), then the third Game of Thrones book and then I might try the audiobook of Wolf Hall. I have owned Wolf Hall since it first came out but never actually read it, so by listening to it on audio I will finally be crossing it off the list. Also, someone mentioned that the audio version was very good so we will see. The narrator of an audiobook can make or break the listening experience. Most of the time they enhance the listening experience but sometimes either the voice just doesn't work or the accents are wrong or whatever. Which brings me to the listening experience for Game of Thrones. The narrator for the first three books is actor Roy Dotrice, and I have to say that he is pretty good, and he would have to be given the sheer number of characters he has to voice throughout the story. According to the box, he is now holds the world record for the most number of different characters (thank you George R R Martin!). It has been interesting listening to the book after having seen the TV adaptation. Normally I make a my practise to read a book before seeing the movie or TV series but so far I have watched two and a bit seasons of the Game of Thrones TV series. I was watching the third series but I stopped when I started listening to the books as it was a bit distracting listening to a character do one thing in the book as I was driving and then see them do another thing when I sat down to watch TV. Given that I have already watched the series, it is definitely the actors that I see in my imagination as I listen to the story, even when I know that there are differences between the book and the TV adaptation. I was pleasantly surprised at how true to the book the first series was and that where there were changes that they made sense. For example, one of the few changes I did notice was that some of the young characters were a few years older than the 12 and 13 year olds in the book. For example, Jon Snow was 14 in the book but older in the TV series and Daenerys was much older too - better for modern sensibilities I think. Having already watched the series also helps with motivation to keep going because, as is more often than not the case with books that are so long, there were some slow parts in the action but knowing what was coming meant that you could clearly see the machinations at work. This is something that I am noticing more in the second book as well, mainly because it is not as clear. It feels as though there were more changes made to the second series compared to the book than there were in the first. All the major things are the same but there are times when I am listening when I think that events happened in a different place in the storyline in the TV adaptation. I think how much you notice these changes depends on two factors. How well you know the book or how recently you either read it or, in my case, watched the adaptation and then read the book. How much those changes bother you might depend on one additional factor - how much you treasure the book. It is getting very exciting watching all the news coming out of casting and filming for the series adaptation of Diana Gabaldon's Outlander series, but that is one story that I will definitely see and notice the changes that they make. Getting back to Game of Thrones, I am not going to attempt to cover the plot of Game of Thrones for this post, given it is more a discussion than a review post, but here is the synopsis for those who are interested. I would say that I did very much enjoy the listening experience, and hence went back for more. In my mind, I started using seven hells as a curse, but not yet out loud, and that particular phrase hasn't come up much in the second book. It's always fun when a book you are reading informs your thinking and language, ye ken! I ended up giving Game of Thrones a grade of 4.5/5. Long ago, in a time forgotten, a preternatural event threw the seasons out of balance. In a land where summers can last decades and winters a lifetime, trouble is brewing. The cold is returning, and in the frozen wastes to the north of Winterfell, sinister and supernatural forces are massing beyong the kingdom's protective Wall. At the center of the conflict lie the Starks of Winterfell, a family as harsh and unyielding as the land they were born to. Sweeping from a land of brutal cold to a distant summertime kingdom of epicurean plenty, here is a tale of lords and ladies, soldiers and sorcerers, assasins and bastards, who come together in a time of grim omens. Here an enigmatic band of warriors bear swords of no human metal; a tribe of wildlings carry men off into madness; a cruel young dragon prince barters his sister to win back his throne; and a determined woman undertakes the most treacherous of journeys. Amid plots and counterplots, tragedy and betrayal, victory and terror , the fate of the Starks, their allies, and their enemies hangs perilously in the balance, as each endeavors to win that deadliest of conflicts; the game of thrones. Fables: War and Pieces by Bill Buckingham, The Historian by Elizabeth Kostova, The Briny Cafe by Susan Duncan and listening to A Clash of Kings by George R R Martin. I have had an audible subscription since last Christmas and like it a lot.It keeps the price of the audio books down.I share the subscription with my husband and we trade back and forth so I feel we get even more use out of it. I am mostly using the library because it is free, but one day I will take a look at an Audible subscription. Interesting to see that you listen to the CDs because I've never listened via that format. I always do the digital version. I think of audiobooks in the same way too - an opportunity to listen to books I might not get to otherwise. I typically browse whatever is available via my lobrary's website, and pick something that I've either heard of but haven't gotten to, or just randomly choose whatever sounds interesting. Some times I plan my listening out. Other times I just see what is available and go from there! One day I will get around to investigating digital options! I loved these books in audio and listened to the entire series in only a few months. Yes, there are a few differences in the TV show, but so far I'm okay with them. I think the older characters, for example, is right for our times. The Stark children are still young, but more believable to 21st-century viewers. Outlander: I sure hope the show is fabulous. I love those books! I will definitely be waiting in anticipation of hearing how the Outlander series is. I presume we will have to wait to see it here. I do my audiobooks from the library website via download, so I have the exact opposite experience than you! I agree there are some down sides - though most apps that play audiobooks let you bookmark or go back 15 or 30 seconds to listen again to something. And even though the tracks are long, they usually pause in the same place you ended before (unlike a CD which you would have to start again from the start of that segment). I think Game of Thrones would be a huge commitment on audiobook! I am not sure I could do that. I don't know that I have a lot of strategy with the audiobooks I listen to. I just put a bunch on my wishlist - some classics, some books that I have heard a lot about but never read, some that just catch my interest, and then several that I already have on my shelves but haven't gotten around to reading yet. It has generally worked well for me so far, though I haven't read nearly as many that I already have on my shelves as I originally thought I would have! I've actually read many books that I don't know if I would have picked up otherwise. It is a bit daunting to think that there are 30 plus CDs to get through in order to finish a book but I seem to be getting through a CD a day so it doesn't take that long to get through it in the end.